In 2016, Hospital for Special Surgery (HSS), the world’s leading academic medical center focused on musculoskeletal health, launched an initiative to ensure patients receive the correct level of care with maximum efficiency. As the main point of contact for patients trying to find care, HSS’s referral center played a key role in scaling these access operations. 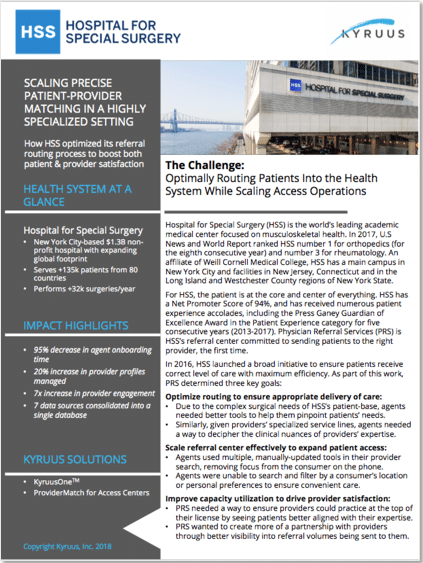 Learn how HSS partnered with Kyruus to achieve a:To support this goal of precise patient-provider matching, the referral center needed a way to identify providers who could deliver appropriate care to patients, not easy given the highly specialized setting and expanding locations. HSS’s goal of delivering consistently and demonstrably superior personalized care begins with our referral center. ProviderMatch enables our agents to match patients more precisely with providers, deliver a differentiated level of service, and instill confidence that we can deliver on and globally scale our commitment to patient experience.